This isn’t the first time I’ve run across this info, but this is from the ABC affiliate in Seattle. NOT a part of the Vast Right Wing Conspiracy, so – perhaps – less easy to dismiss as right wing nonsense. From KOMO channel 4 in Seattle. Seattle is Dying. 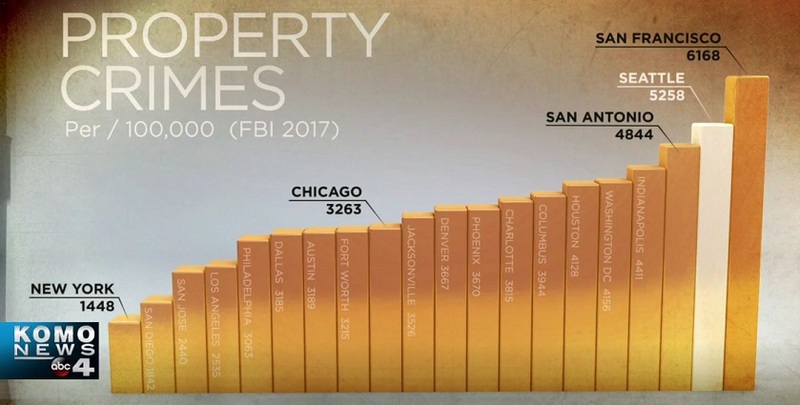 The image snipped from the early portion of the video is of property crimes per 100,000 residents of major cities in the US. Click on the image to enlarge. It’s a 59+ minute video, but worth your time. It documents “Broken Windows” in reverse. And the results are exactly as predicted. You ignore the small things, and things get worse in general. I look at this and it makes me think that Amazon HQ2 wasn’t just about a 2nd location, but the first step in leaving Seattle, because who wants to live in a dump? This entry was posted in Economics, Politics, Your Tax Dollars at Work and tagged Drugs, Homelessness, Seattle. Bookmark the permalink. ← How Old Do You Have To Be To Defend Yourself? I’ve already been writing to my Congresscritters, who must think I’m crazy. The whole state of Illinois is in trouble, not just Chicago. And California isn’t much better. General financial trouble, and insanity if you look at unfunded pensions. Seattle is far less of a dump than New York, and possibly less crooked and cheaper. The HQ2 thing at New York never smelled right to start with. Same for Boeing’s announcement of moving their HQ to Chicago some years ago. The usual guide is “follow the money”, but the spiffs NY offered were only good in the short term, and after that, it’s an expensive place to run a business, which is why businesses are steadily leaving New York. Bezos personally wouldn’t benefit, Amazon as a corporation wouldn’t benefit, which makes me wonder who is really running the show there nowadays. The cool kids who work for Amazon don’t want to live in a place where the costs are low. Amazon could have looked at places that have no state taxes, but Jacksonville, FL isn’t cool enough. And they wouldn’t even consider Alabama, or Tennessee – definitely not cool enough for Amazon.